Dave Ramsey is America's trusted voice on money and business. He's authored seven National Best Sellers including three #1 National Best Sellers. "The Dave Ramsey Show" is heard by more than 8.5 million listeners each week on more than 550 radio stations, "The Dave Ramsey Show" channel on iHeartRadio and a 24-hour online streaming video channel. You can follow Dave on Twitter and Facebook. For more content, resources and events, visit daveramsey.com. Get more information on booking one of Dave Ramsey's speakers for your next event, including media availability, detailed speaking topics, fees, and more. Dave Ramsey—author, talk show host, and personal finance expert—has a simple message for people who want to change their financial lives: It will be hard work, but it will be worth it! No matter where you are in your Total Money Makeover, we're here to help you take that next step. 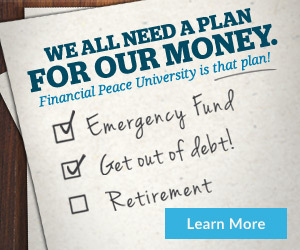 Get started now by visiting DaveRamsey.com.